Profiles covering all forty-three communities in the Pioneer Valley Region and a range of other topics are available. The Pioneer Valley Planning Commission Data and Policy Center provides demographic, economic, and geographic data and services including mapping, research, and analysis to its constituent communities and to the public. Contact the Regional Information and Policy Center for additional information. 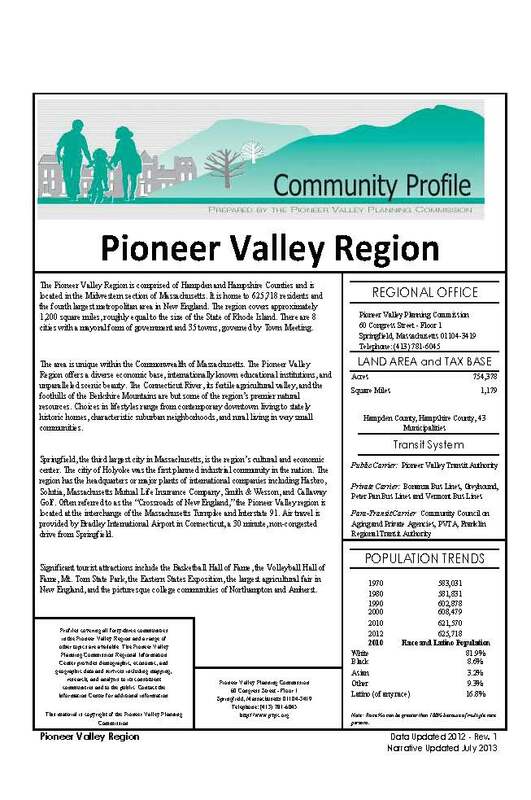 Pioneer Valley Profile updated 2015. Hampden County Profile updated 2015. Hampshire County Profile updated 2015. Agawam Community Profile updated 2015. Amherst Community Profile updated 2015. Belchertown Community Profile updated 2015. Blandford Community Profile updated 2015. Brimfield Community Profile updated 2015. Chester Community Profile updated 2015. Chesterfield Community Profile updated 2015. Chicopee Community Profile updated 2015. Cummington Community Profile updated 2015. East Longmeadow Community Profile updated 2015. Easthampton Community Profile updated 2015. Goshen Community Profile updated 2015. Granby Community Profile updated 2015. Granville Community Profile updated 2015. Hadley Community Profile updated 2015. Hampden Community Profile updated 2015. Hatfield Community Profile updated 2015. Holland Community Profile updated 2015. Holyoke Community Profile updated 2015. Huntington Community Profile updated 2015. Longmeadow Community Profile updated 2015. Ludlow Community Profile updated 2015. Middlefield Community Profile updated 2015. Monson Community Profile updated 2015. Montgomery Community Profile updated 2015. Northampton Community Profile updated 2015. Palmer Community Profile updated 2015. Pelham Community Profile updated 2015. Plainfield Community Profile updated 2015. Russell Community Profile updated 2015. South Hadley Community Profile updated 2015. Southampton Community Profile updated 2015. Southwick Community Profile updated 2015. Springfield Community Profile updated 2015. Tolland Community Profile updated 2015. Ware Community Profile updated 2015. Westfield Community Profile updated 2015. Wilbraham Community Profile updated in 2015. Williambsburg Community Profile updated in 2015. Worthington Community Profile updated in 2015.